An archivist friend recently commented on the difference in cultures between archivists – whose professional ethic is to make research materials available to any and all researchers – and his historian colleagues – who would rather hide such material away from historian-competitors. Academic competition: we tend view it the same way we view commercial competition – as a mechanism to ensure improvement and progress. Students compete for grades because only the “best” will gain admission to prestigious colleges, or to the best graduate schools. Good graduate student grades,one presumes, gives the most “competitive” students a leg up on securing increasingly rare tenure-track academic posts. I was cautioned when I first entered medical school to be careful to hold on to my class notes as they would tend to “disappear” just before exam times – sequestered, as it were, by classmates who hoped thereby to gain a competitive grade advantage. In medical school, high graduating class position garners entrée into the finer residency programs. As I’ve portrayed it, scholarly competition smacks of an “every man for himself” mentality, and to be sure, the western model of academic endeavor features the scholar laboring in glorious solitude to create his or her piece of brilliance. We put academics in Ivory Towers for this express purpose. I do not mean to denigrate the immense value of serious scholarship undertaken by intrepid individual researchers both past and present. Even so, there is something wrong today with this picture. Almost every field of non-commercial human work now demands some element of collaboration, if for no other reason than this is how we learn to communicate with others. Anthony Grafton, President of the American Historical Association, in addressing the two generation “crisis” of disappearing tenure-track positions for new history PhDs has made the “very modest proposal“: that graduate programs in history should tell their students in no uncertain terms that at least half of them will have to look for work outside of the academy. In citing a traditional academic attitude, he declares that “… many of our students who actually do leave the historical profession, and take what they’ve learned in graduate school to the business world, are seen as having crossed the line from the light of humanistic inquiry into the darkness of grubby capitalism…” Grafton’s very modest proposal is that history programs should actually encourage preparing their students for this eventuality, for instance by adding an “additional course or two, adventures into new realms of knowledge that build skills for diverse careers.” He adds that graduate programs could offer “workshops to explore the world of work” [methinks here’s that “grubby capitalism” creeping in – or the medieval concept of getting your hands dirty…] and internships to get folks “even deeper experience, although [of course!] care would have to be taken to integrate them into dissertation writing calendars.” In a follow-up article, “Plan C“, Professor Grafton and his co-author Jim Grossman (Executive Director of the AHA) correctly expand the theme to encourage development of graduate program offerings to create a “wide platform of occupational options”. I think Professor Potter misses a key point here: there’s no mention of the collaborational opportunities available in such hybrid historical organizations as the Society for the History of Navy Medicine (our sponsor), the American Association for the History of Medicine, or the Society for Military History. I would say, “you need to add scholarly collaboration with specialists outside the narrow halls of history to help your PhD candidates see other areas rich with exciting intellectual – and occupational – possibilities”. Who Should Write Medical History? In the past month, I’ve had the good fortune to attend two talks by Ian W. Toll, author most recently of Pacific Crucible: War at Sea in the Pacific, 1941-1942. * In both talks, he introduced his writing philosophy by quoting a “friendly critic” who wrote – concerning his first book, Six Frigates: the Epic History of the Founding of the United States Navy* – that Mr Toll had “drifted off target” by dealing with the social and political history surrounding the construction of our nation’s first fleet. Mr Toll went on to his own criticism: that naval historians have traditionally contented themselves with descriptions and analysis of tactics and battles, of throw weight and fleet maneuvers – to the exclusion of the larger historical context in which these details found their existence. Toll goes on to paraphrase the old saw about war fighting and generals: leaving history writing to the historians might be a dangerous thing. I’ve written about this theme before in making an argument for “hybrid” history, as it has been written by historians of medicine in the past. In the nineteenth and early 20th centuries, almost all western medical history was researched and written by men trained to be practitioners of the medical art, not by professional historians. The names Henry Sigerist and Oswei Temkin spring immediately to mind. Both were German emigre’ physicians, educated in the classics as well as in medicine, who devoted most of their careers to building the foundations of the canon of medical history. William Osler, esteemed by western physicians as the father of modern medical education and who is still seen as the medical practitioner’s medical practitioner, had a keen appreciation for ancients of medicine and steeped much of his medical thought in its historical antecedents. But could physicians who write medical history be criticized for being too focused on the tactics and throw weights of medical treatment to the exclusion of the larger social or historical context? Howard I Kushner in a 2008 Lancet article put it this way: “…many physicians, untrained in academic history, write about the past and are labeled ‘historian’.” To be sure, “local” historical writing undertaken by the occasional retired practitioner may smack more of “famous person history” than of any serious historical undertaking. Professional historians’ criticism of much doctor-written history in general is that it fails to take into account the social context – and even the “belief system” – in which the medical treatments and events take place. What the historians miss, I think, is that physician historians tend to see their endeavors, and therefore their history, as based on immutable “scientific” foundations. This “kind” of history is not legitimately amenable to, or benefited by, traditional historic0-social analysis. Moreover, physicians may see professional historians themselves as particularly susceptible to error based on “cultural” and “belief system” biases. Think “Marxist” history or “Whig” history – both legitimate “schools” of history, but with quite different takes on historical persons and events. And there the division lies. As Kushner describes the schism, in the U S, physician historians belong to the American Osler Society; professional historians prefer the American Association for the History of Medicine. And never the twain shall meet. But the twain must meet. I maintain that professional historians of medicine need their physician colleagues’ historical work to give medical legitimacy and scientific understanding to their endeavors; doctors need the historians to guide us away from a narrow sort of navel gazing. The Society for the History of Navy Medicine is participating in such a collaboration in April. 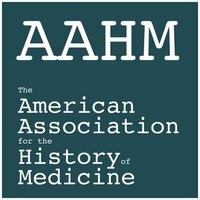 We submitted a doctor-only^ panel on naval medicine in Vietnam to the American Association for the History of Medicine. This panel was not accepted for a regular session at the annual AAHM meeting. But association planners – historians all – felt that the material represented in the papers was too important to be lost. As a result, AAHM will sponsor our panel as a separate luncheon event during the conference in Baltimore. The open nature of this panel in a casual setting will actually permit a more wide-ranging discussion of the material than would be possible in the standard academic panel setting. It’s a win-win situation as I see it – an opportunity for all of us to collaborate in learning, historian and physician alike. “*” – these links connect to Amazon.com. If you purchase a book via the links, the Society for the History of Navy Medicine will receive a small commission. “^” – we’ve since added Jan Herman, a professional historian at the Navy’s Bureau of Medicine and Surgery, to this panel. The City of Dublin, California, was the home of the U S Navy’s World War II “U S Naval Hospital, Shoemaker, California”. Town history goes back to the 18th C: a local water spring early served the needs of travelers in the Amador Valley, which lies to the east, behind mountains that rim the San Francisco Bay. A little community developed to cater to two crossing stage-coach routes – one running east and west between the Bay and Stockton in the California interior and a route running between Martinez to north and San Jose to the south. The Amador Valley was an agricultural area when war came. It was large, wide and flat – and close to the large Naval bases then present in the San Francisco Bay – ideal for placement of a large Naval logistical center that came to be known as “Navy City”. The Naval hospital, initially provided care to the 15,000 or more people working and stationed at Navy City. 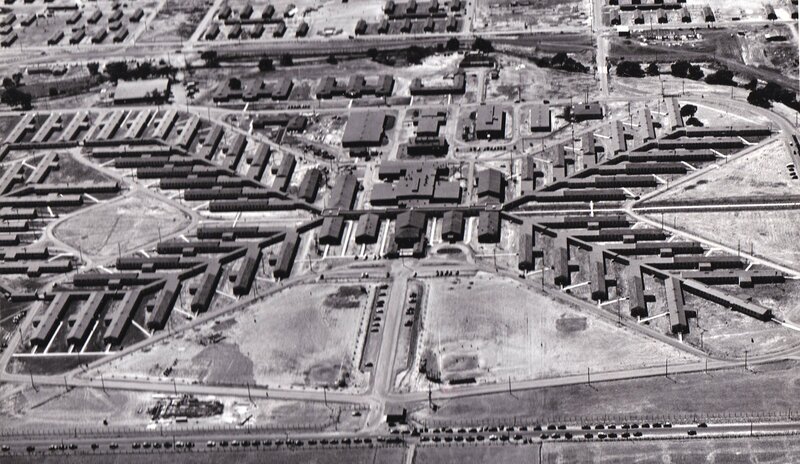 But it quickly grew to 2500 beds, and ultimately served the combat injured from the Pacific Theatre of war. Today, the “Old Town” section of Dublin represents just a small part of a city characterized by California-modern townhouses, condominiums, large business parks and shopping centers. Navy City along with its accompanying hospital is long gone. Fortunately, a dedicated group of citizens, backed by their City government, have sought to make something of their past. They’ve developed a donated turn-of-the-20th Century farm into a historical center. Volunteers, supported by Dublin Heritage Park & Museum Director Elizabeth Isles, are busy at work enhancing their City heritage by collecting artifacts, and researching to write about the City’s history. The former Shoemaker hospital site is now a spacious, comfortable City park complex. I became familiar with Dublin because the Society for the History of Navy Medicine, of which I am Executive Director, is developing a program to place plaques on sites of significance in the history of Navy medicine. Because of Dublin’s proximity to my base of operations, and because of the uniqueness of the Naval Hospital formerly located there, I contacted Dublin officials to explore the notion of placing our first plaque there. I was referred to Ann Motolla, Dublin’s Heritage and Cultural Arts Manager. Quite remarkably – in this age of governmental restraint – Ms Mottola offered enthusiastic support of the idea, and today I went to Dublin to meet her and Ms Isles. We walked the hallowed ground of the former hospital, to the top of a small hillock which overlooks the entire hospital property – an ideal spot, my friendly guides pointed out, for a plaque containing an aerial view of hospital along with a short historical narrative. The message I received today was, “We value our history and we want to promote our past as a way to give our citizens a sense of ‘rootedness’. We welcome your idea, we’ll try to make it easy to do, and there might even be a little financial support from the City – at least for a display pedestal for mounting the plaque”.